I started this holiday season feeling overwhelmed by my consumerism and the consumerism around me…I apparently am not the only one. I didn’t even want to put up our Christmas Tree, but there would’ve been a mutiny on my hands had I not. I was thinking in bed one night and decided that I wanted my kids to come home for the holidays when they were older…in college and so on. In college, I went to Disney in FL with some friends. We all skipped out on the holidays with our families. I want my kids to WANT to come home…that they would love the comfort and traditions of the holidays. And I wanted to teach them it has nothing to do with the stuff. 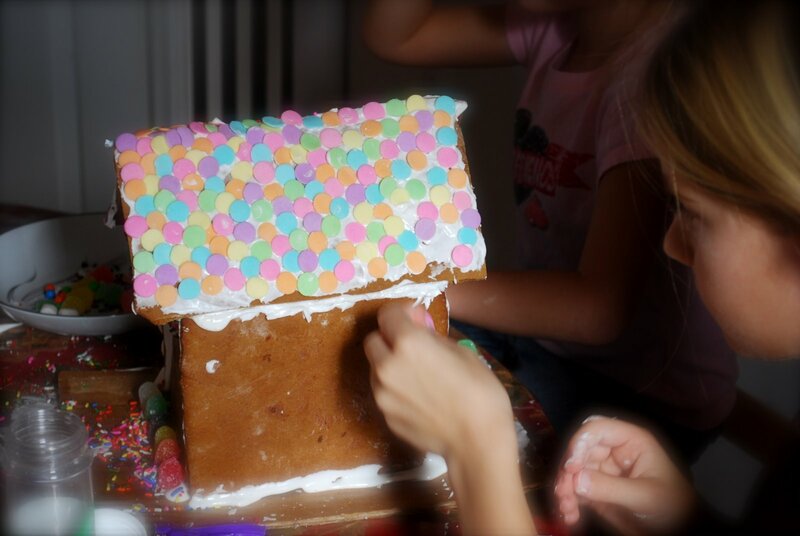 We are making handmade gifts this year and creating some new traditions…like gingerbread house making. Our gingerbread host was a gracious one. 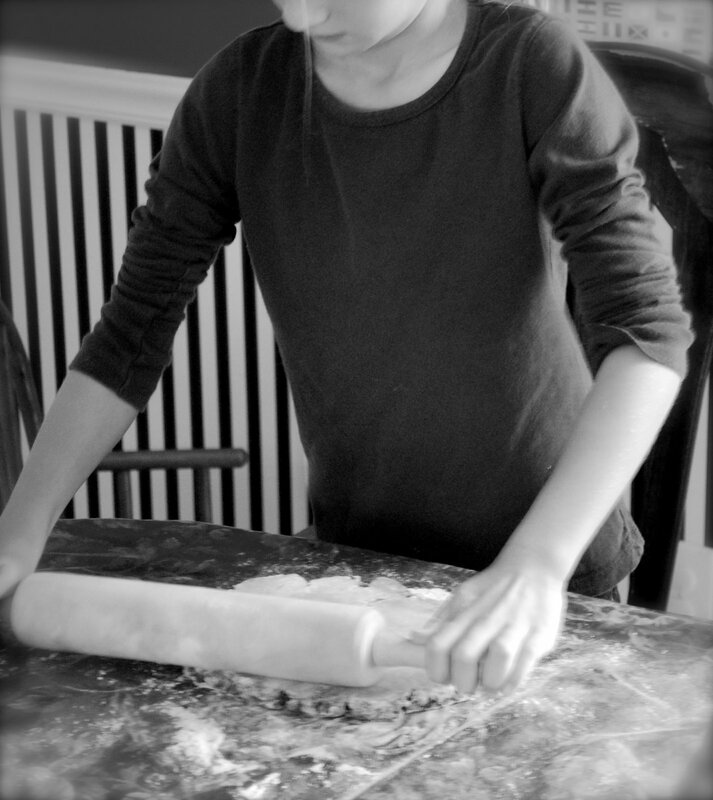 She had the dough ready for us to roll when we arrived. We each rolled, cut and decorated meticulously. Memories were made! Fun was had! We did this this year too, and had SO much fun! I blogged about it here:http://www.threadsofconversation.blogspot.com/2008/12/you-cant-catch-me-im-gingerbread-man.htmlI’m trying to establish more non-consumer traditions to add more meaning as well…Great post! 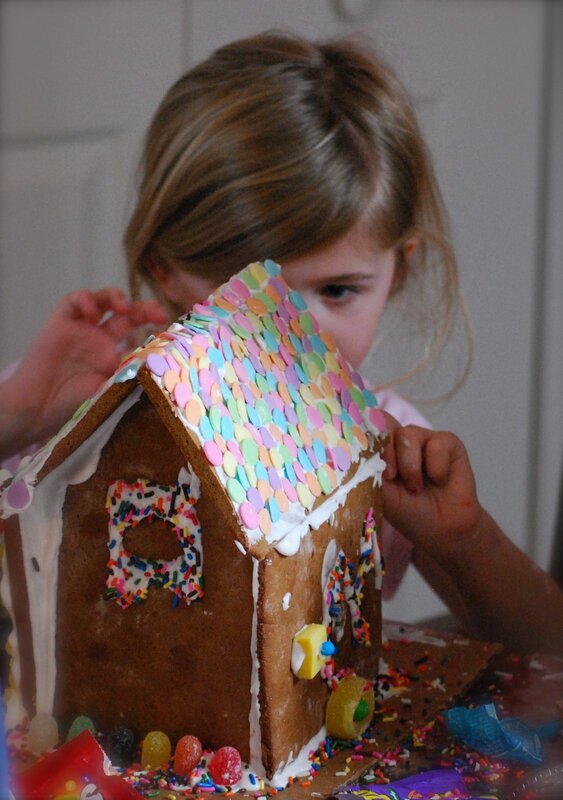 Cute Gingerbread houses, I’ve always wanted to make one, one day I will! I especially love the rooftop of this gingerbread house! Cute & pastel-ly! Here's to a simple & wonderful traditions! wow! you’re doing great! I can’t do that! That’s cool! !